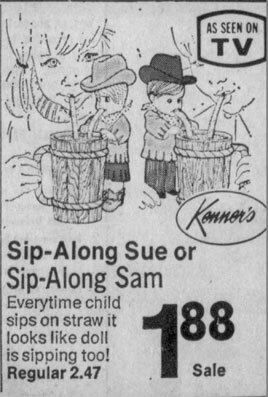 In 1972, Kenner released Sip-Along Sue, a novelty toy for the pre-school set that added a bit of fun to beverage consumption. Like her counterpart, Sip-Along Sam, Sue stood 6 ¼-inches tall and was decked out in full cowgirl regalia, complete with boots and a swanky 10-gallon hat. She was articulated with a movable head, arms, and legs, so she could be made to sit and stand like a typical doll. Sue could be attached to a washable mug shaped like an open-ended barrel – a familiar prop in Western movies and television shows of the time – that held up to a half-pint of liquid. 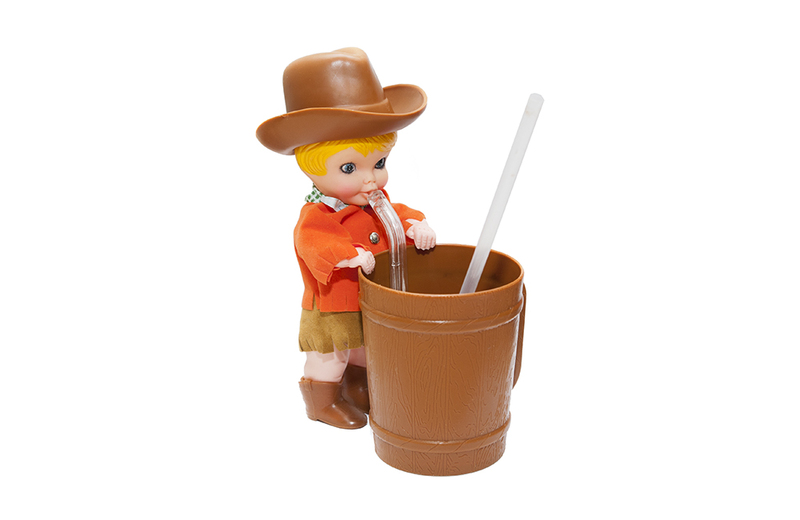 When a child sipped on the straw, the liquid in the mug would simultaneously rise up the doll’s straw, giving the illusion that Sue was drinking along with the child. Of course, the plastic straw was closed at Sue’s mouth, ensuring that no liquid actually went into the doll. Sip-along Sam and Sip-along Sue. A cowboy for me and a cowgirl for you. Give ’em a straw and see what they do. When you take a drink, they sip-along too.